Имате въпрос към Shalom Resort? 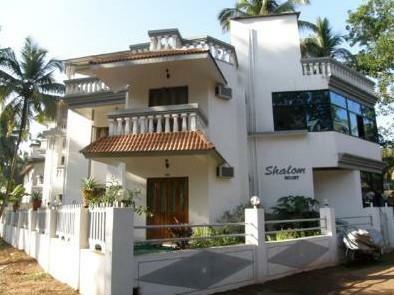 Shalom Resort, който се намира в Кандолим, Goa, е популярно място за туристи. Хотелът се намира се на 18 km от центъра на града, поради което неговите гостите могат безпроблемно да се наслаждават на всички градски атракции. Посетителите на хотела могат да се насладят на тур из най-известните забележителности на града като например Мол Calangute, Водолазен център Goa Aquatics, Кандолим Бийч. Shalom Resort също така предлага много съоръжения за обогатяване на Вашия престой в Goa. Съхраняване на багаж, паркинг, рум-сървиз, летищен трансфер, коли под наем са само част от нещата, които отличават Shalom Resort от останалите хотели в града. Shalom Resort разполага с 9 стаи, които са обзаведени с вкус. Много от тях предлагат удобства като телевизор с плосък екран, климатик, събуждане, бюро, балкон/тераса. Освен това в хотела можете да се възползвате от множество предложения за приятно прекарване на свободното време. С перфектното си местоположение и несравними удобства, Shalom Resort е един чудесен избор в много отношения. Отседнахме 8 вечер/и в март 2018 г. The hotel is quiet. A big plus. A five to ten minute walk makes the beach very accessible. I can't recommend too highly. Отседнахме 10 вечер/и в октомври 2017 г. 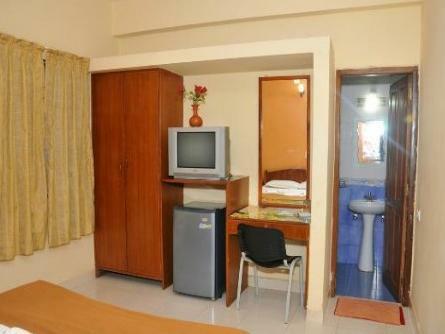 Nice budget hotel with a location close to Candolim beach.Owner and the staff are very helpful and always available. Only negative is they do not have their own restaurant, though tea, coffee and bread are always available. The owner, Ganesh, and all the workers there could not have been nicer. They all went out of their way to make our stay incredible. When, I was sick he brought me medicine. He even upgraded our rooms at no cost mid-way through our stay. Most of all he made us feel at home and that we were his family. I couldn't recommend him and Shalom resort enough. Btw you will love his Masala Omelette too. Thanks Ganesh! arriving at the Shalom resort,first impression was Great. Management an staff were friendly, and went out of their way to please. We were taken up a Steep Winding staircase to the third floor. Anyone Old or Frail would not be able to manage, especially with baggage. There are no toiletries at all, not even toilet paper. The apartment was Badly in need of maintenance ( Toilet seat falling of, etc.TV Old and poor reception ) The Hotel is a long way from the beach or night life. I would not recommend anyone with Children, or Old stay there, although the pool is only three feet deep. There are far cheaper and better places for the price, and location. Taxi's in Goa are expensive. Fortunately I had my own transport. Would I go back there ? Only for a third of the price. Отседнахме 11 вечер/и в февруари 2016 г. Had a very peaceful and relaxed time . I suffered heatstroke and was poorly and Ganesh ( the manager) was totally hands in and made sure I was ok and checked on me regularly to see if I needed anything , and also had a minor moped accident and especially went to pharmacy and got me bandages , deep heat and everything I needed , Hotel itself is the best I have stayed in whilst in Goa , proper mattresses , excellent pillows , pleasant surroundings and generally 11 out if 10 , can't wait to go back next year ! Ganeshbhai OMG, Best person i ever see in my life. God bless you ganeshbhai keep your nature like this only. 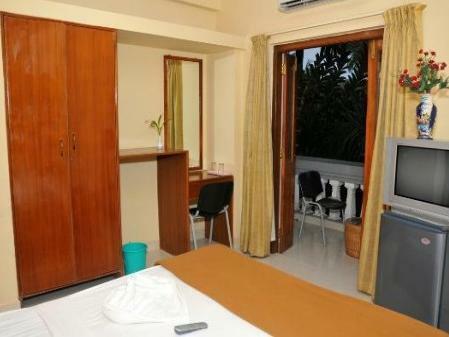 if you searching for budget hotel don't think it just book this.Hotel staff is so helpful and so kind, all beach are near and shree sagar pure veg hotel is best for veg and jain people. it was my anniversary and Ganeshbhai gift us 2 candlelight diner set and bouquet of flowers.we feel so good. i stay for 3 night 4 days & Ganeshbhai guide me so well,which day/which place and which one in budget.Rooms are clean and have attach balcony.Any time get Hot water in bathroom. I had originally scheduled my stay in Goa for 3 days but when i arrived i felt so comfortable at this hotel that i stayed more. The owner, Mr. Ganesha, was literally the best person I encountered in India. He has such a kind heart and is always going out of his way to help his guests. One night I was walking down the road and I saw him pass by on his motorbike. I was positive he didn't see me, but a couple of seconds later, he turned out just to check if it was me, and he gave me a ride back to the hotel. He arranged tours and transportation for me in order to save me money. He could have charged me more for things but he didnt. The location is great, close to the beach and close to a huge assortment of restaurants and shopping. The bed was one of the first beds that i have come across in Asia that actually had a full on thick comforter. I get it often in 5-star places, but this is the first hotel that i have had this, that wasn't 5 star. All of the staff at the hotel go out of their way to accommodate. I ordered food for delivery and without even asking they came to my room with a tray, plates, silverware and napkins. They did silent service very well and I will always go back to this place when i return to Goa. I felt welcomed and very comfortable in this room and with all of the staff. Thank you to everyone! Отседнахме 13 вечер/и в февруари 2015 г. Wonderful. Such friendly helpful owner and his staff. Could not do enough for us. Rooms were great and location so peaceful. I had intended only staying one night in Candolim but I found the helpfulness of the owner and his staff to be excellent. Anything I enquired about, Ganesh went out of his way to accomodate me. The room was lovely, with a balcony either side and was spotless too. Highly recommended. Dedicated Management and Staff. Excellent Services. Peaceful and beautiful small garden. Excellent. We have been treated as VIP. We would highly recommend Shalom Resort to all our friends. C est le meilleur hotel que j ai pu faire durant mon séjour, ganesh le propriétaire est une personne formidable et fera parti des rencontres magiques que j ai eu en Inde... Sa gentillesse, sa disponibilité et sa simplicité font chaud au cœur, on a tout simplement l impression d être un membre de sa famille... Son hotel est très propre et je le conseille à toutes les familles avec des enfants en bas âge... La piscine est très propre ( ce qui ne fut pas le cas partout) et l emplacement de l hotel est génial!!!! Bref la meilleure adresse de l etat de Goa!! Shalom Resort, di Goa. Sangat menarik Gan ke India, terutama Goa. Ini trip pertama kami ke Asia Selatan,kami berangkat ke goa karena ada promo tiket Airasia, cuma bayar 3 juta PP berdua dari CGK-KUL-GOI, Goi-Kul-CGK, dan sewaktu baca baca mengenai india mmpphh... serem juga, tapi sewaktu membaca mengenai Shalom Resort dengan Mr. Ganesh nya, hal itu menjadi keputusan kami untuk memilih Shalom resort. selain harga juga tidak terlampau mahal, lokasi yang sangat baik di Candolim Goa, walaupun agak unik kondisi kamarnya ( kunci pintunya pakai gembok, dan slot kayak di lemari ). Jumlah kamarnya tidak banyak hanya 9 kamar saat ini, tetapi hikmahnya kita bisa dilayani pribadi oleh Mr. Ganesh. Tetapi dengan adanya mr. Ganesh, kita bisa bertanya apa pun dengan beliau, dari transportasi di Goa, dan Mr. Ganesh juga tidak segan untuk merekomendasi atau menghubungi teman temannya seperti pengalaman kami sewa motor, beliau menghubungi temannya dan tanpa banyak persyaratan apapun motor datang, langsung diberikan dan harga sewa juga lebih murah ( Mr. Ganesh tidak mengambil fee atau keuntungan apapun ), pulang ke airport juga dibantu dengan dicarikan taxi best price, saran saran mengenai object tourist yang wajib sampai yang tidak wajib kita pergi, berikut bagaimana caranya dan berapa harganya. Perjalanan India kami menjadi sangat nyaman dengan adanya mr. Ganesh ini, setelah merasa horor dengan bacaan bacaan yang ada di internet mengenai india. Beliau juga ramah dan tidak segan untuk menolong, jadi rekomendasinya untuk hotel di Goa silahkan pilih Shalom Resort Gan, ane bisa bilang seperti ini, hotel ok, standard Gan, sesuai harga. yang penting bersih, agak kecil kamarnya tapi AC, dan TV LCD 50 channel lebih(kettle dan Air minta manual Gan, kami tidak diberi kemarin). Hasil informasi dari mr. Ganesh nilainya lebih, karena kita kayak punya teman baik di Goa, dia siap membantu, sehingga liburan India kita menjadi Nyaman. Itu Pointnya mengenai Shalom Resort.